Last night, sublime music, women’s voices soaring in a Medieval Women’s Choir concert at Trinity Church. I was transfixed, transported by the voices. During the instrumentals I closed my eyes and watched all my beloved characters dancing to the vielle and harp. Members of the Medieval Women’s Choir will perform at my book launch on 4 May at the University Bookstore in Seattle! When I began my career in crime writing, my library from graduate school was light on women. I scrambled for information about women in the 14th century, sifting through mountains of books, documents and papers hungrily copying down the smallest of gleanings about women and their lives in the period. But as you know if you keep up with the field or if you’ve followed this blog, that has changed. Radically. Historians are writing brilliant books about women in the middle ages. Hurrah! Where to begin?! If you’re just starting, I can’t think of a better introduction and overview than Susan Signe Morrison’s new book, A Medieval Woman’s Companion (Oxbow Books 2016). 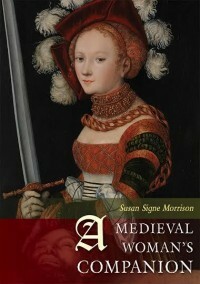 A few weeks ago, as a guest on this blog, Susan treated us all to a lively discussion about how we might make use of her new book in writing novels about medieval women. So you’ve already sampled Susan’s engaging style and the range of women she discusses. Not only does Susan introduce the reader to a grand assortment of women from a wide variety of backgrounds, but she discusses the broader themes touching on women’s lives at the time—attitudes about women’s bodies; women’s occupations; religious movements; women in the arts, including playwrights and troubadours and Japanese writers. Each chapter includes a resource guide for further exploring the women and the topics. The resources include websites, videos, novels, as well as source documents. Who can resist a book with chapter titles such as: “Textile Concerns: Holy Transvestites and the Dangers of Cross-dressing”? The chapter isn’t solely about cross-dressing, though that isn’t just a come on. Susan discusses the political implications of clothing including the sumptuary laws, how water-powered mills for grinding grain freed women to work in textiles—and all facets of that production, and, yes, the women who dressed as men to protect themselves or to protect their cities and kingdoms—women donning armor! One of my favorite parts of the book is the final chapter, “Looking Forward” Contemporary Feminist Theory and Medieval Women.” Susan states at the beginning: “Medieval women’s lives and writings prefigure many issues that have arisen in more recent times. Indeed, the medieval period helped form current beliefs and attitudes toward women.” In this chapter Susan cites a wide assortment of writers on the importance of revising what we consider the “canon”, that is, the works considered worthy of study in schools and universities, as well as the necessity of questioning attitudes we’ve carried forward through the ages—women’s work is unimportant, women’s innocence is best protected by ignorance, how women have been considered the Other. The chapter is thought-provoking and engaging, not angry. If you are using this book for a class, this is the chapter I’d imagine inspiring the liveliest discussions with support from the earlier chapters. As if all this weren’t enough, Susan has created a companion website for the book that will be continually updated—in fact, she’s already adding material. If you’re writing about medieval women or teaching medieval history or literature, this book is an essential. What a resource! My graduate school reading that was so light on women—that is happily a thing of the past. The study of beguines represents a significant challenge for historians of women and gender. In the beguines, the historian is confronted with a gendered label (“beguine” as French historian Nicole Bériou has observed, might refer to a way of being perceived by others) as well as the experiences of real women who chose to live religious lives in the world. Women who wore humble garb and stood apart as living a religious life above and beyond the ordinary practice of their peers might be labeled “beguine,” perhaps admiringly, perhaps derisively. At the same time, some women consciously joined communities of like-minded lay religious women, adopting the label “beguine” by virtue of entering a recognized community. 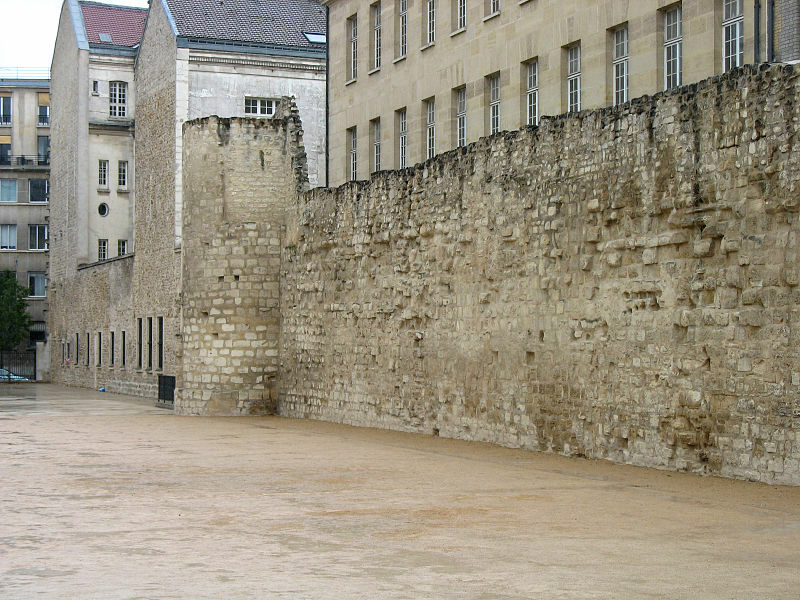 The remaining wall of the beguinage of Paris ( which was actually the wall of Philip Augustus in the Marais). The beguine communities of medieval Paris—heretofore unstudied save for a single article published in the late nineteenth century—usefully illustrate these complexities. Upon returning from crusade in 1254, the French king Louis IX (also known as Saint Louis) founded a house—or beguinage—on the eastern end of Paris to house “honest women called beguines.” The Paris beguinage was modeled on the court beguinage of St. Elizabeth in Ghent, giving the French king’s house a useful boost as a solid community of lay religious women. The Paris beguinage was surrounded by walls, governed by statutes, and eventually overseen by the Dominican prior (it should be noted, however, that the Paris beguinage was quite porous, with residents and visitors regularly entering and leaving the enclosure). Its residents wore a distinctive habit and enjoyed the support and projection of the French kings until the house was turned over to a community of Observant Poor Clares in 1485. Even with the existence of this more “official” beguine community, Paris was home to dozens of households of women who self-identified, and were recognized in their local communities, as beguines. These households are known to us thanks to the tax assessments compiled during the reign of Louis IX’s grandson Philip the Fair (r. 1285-1314) and represented another possibility for Parisian lay religious women. Significantly, some religious and secular authorities insisted on approximating beguines to nuns, denying the beguine “status” to women who did not reside in an officially-recognized, enclosed, and regulated beguinage. 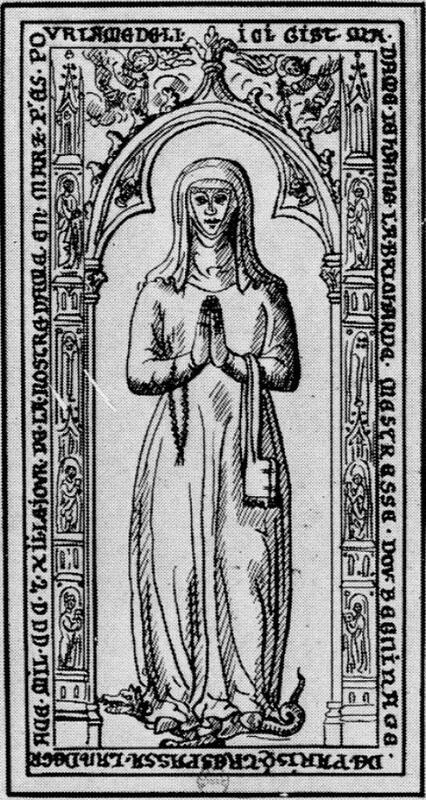 Jeanne Brichard, one of the mistresses of the Paris beguinage (a sketch of her tomb, which was located in the Dominican convent in Paris). On the other hand, admirers such as the secular cleric Robert of Sorbon (d. 1274) noted that beguines exhibited far more devotion to God than even the cloistered, since they voluntarily pursued a religious life without vows and walls, surrounded by the world’s temptations. Robert was a contemporary of Rutebeuf and he was a close friend of Louis IX. He was also the founder of the famous Parisian college for secular clerics, the Sorbonne. Robert’s opinions of the beguine life clearly reflected his personal views on community, public perception, religious sincerity, and the secular clergy’s mission in the world. He was not alone in this tendency to interpret the beguine phenomenon in light of personal concerns. Beguines, in a sense, were all things to all people. Clerical opinion of the beguines was quite mixed. For some, it was too flexible, too dynamic. Yet, it was the flexibility and dynamism of the beguine life that encouraged thousands of women all over medieval Europe to take it up in the first place. Inspired by the new apostolic piety of the thirteenth century, with its emphasis on poverty, preaching, and imitation of Christ, beguines found ways to pursue their spiritual ambitions, in spite of contemporary prohibitions against women’s participation in these central features of the vita apostolica (that is, the apostolic life). To reconstruct the world of Paris’s beguine communities, I needed to tell the story from a multiple perspectives. Parisian women who decided to live as beguines did so under specific social, cultural, and economic conditions. As a historian attempting to understand these conditions, I found myself grappling with the categories and labels with which medieval observers discussed the beguine phenomenon. I needed to understand why medieval people adopted or applied the label “beguine” and what they meant when they used the term. At the same time, I could hardly ignore the lived circumstances of women who were known in their communities as “beguines.” The tax rolls—perhaps considered among the driest of documents—were, and are, an incredibly exciting treasure trove of information, since they help illuminate the world of women’s work and friendships. Testaments and property records helped fill the gaps, fleshing out women such as the beguine and silk merchant Jeanne du Faut, who made frequent mention of her “beloved” business partner and fellow beguine Beatrice la Grant in her testament. A wealthy silk merchant with a broad social network, Jeanne bequeathed her entire estate to Beatrice, in spite of the existence of several male relatives. Medieval Paris was home to many other women just like her. The beguines living in Paris’s beguinage forged productive and enduring ties to clerics studying and teaching at the University of Paris. While there are still many who assume a hostile—or at least tense—relationship between religious women and clerical authority, sermons and pastoral literature produced by scholars affiliated with the medieval college of the Sorbonne paint a far more complex picture. Masters and students of the Sorbonne frequented the beguinage of Paris, following the example of the college’s founder Robert Sorbon. Sermon collections contain dozens of sermons preached at the beguinage of Paris, as well as several excerpts preached by the mistress of the beguinage herself. Bringing these threads together, the book seeks to uncover the history of communities of women who were at the center—not the periphery—of economic, social, political, and cultural life in medieval Paris. Nicole Bériou, “Robert de Sorbon, le prud’homme et le béguin,” Comptes Rendus de l’Académie des Inscriptions et Belles Lettres, (Paris:1994) 474-82. Léon Le Grand, “Les béguines de Paris,” Mémoires de la société de l’histoire de Paris et de l’Ile-de-France 20 (1893) : 295-357. As reported in Geoffrey of Beaulieu, “Vita ludovici noni” Recueil des historiens des Gaules et de la France, (henceforth RHF), ed. Martin Bouquet et al. vol. 20(Paris, 1840), 12. Rutebeuf, “Les ordres de Paris,” Oeuvres complètes, 2 vols., ed. Michel Zink (Paris: Garnier, 1989), 1: 227. Rutebeuf, “La Chanson des ordres,”Oeuvres completes, 1: 332. Beguines were a frequent target in French literature; see Renate Blumenfeld-Kosinski, “Satirical Views of the Beguines in Northern French Literature,” New Trends in Feminine Spirituality: The Holy Women of Liège and Their Impact, ed. Juliette Dor, Lesley Johnson, and Jocelyn Wogan-Browne (Turnhout: Brepols, 1999), 237-249. Dyan Elliott, “The Three Ages of Joan Scott,” American Historical Review (2008):1390-1403. An early attempt to discuss the power of the label is found in my article “What’s in a Name? Clerical Representations of Parisian Beguines (1200-1328).” Journal of Medieval History 33, no. 1 (2007): 60-86. 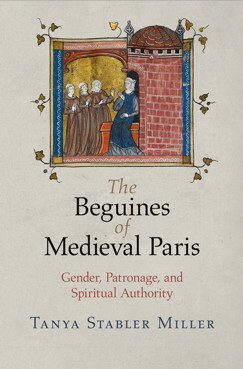 The University of Pennsylvania Press has just published The Beguines of Medieval Paris: Gender, Patronage, and Spiritual Authority by Tanya Stabler Miller http://www.upenn.edu/pennpress/book/15228.html, and tomorrow Tanya will be a guest on this blog! My thanks to Jennifer Kolpacoff Deane, who was my guest in December, for alerting me to Tanya’s book. Tanya Stabler Miller received her PhD from the University of California, Santa Barbara in 2007. She is a historian of medieval Europe, focusing on the social, cultural, and religious history of the High Middle Ages (1000-1400), with a particular interest in communities, intellectual authority, material culture, and gender. Currently, her research has turned to the medieval college of the Sorbonne and the interplay of learned and popular traditions in devotional literature, which led to the new book as well as several articles. In tomorrow’s post she provides a brief history of the beguines in Paris, how they were received–they inspired some controversy, and how her particular interests led to writing the book. You’re in for a treat! I’m delighted to continue the dialogue about these remarkable women.